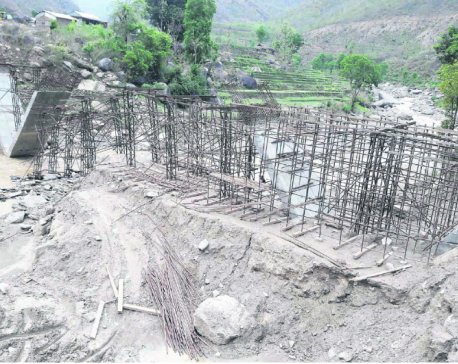 SOLUKHUMBU, Feb 8: Work to build a suspension bridge over Imja River, which lies along the trekking trail to the Everest Base Camp, has not begun even though locals formed a consumers' group to facilitate the work two years ago. According to initial plan, the bridge, which links Ward No. 6 and 7 of Khumjung village development committee (VDC), should have been ready seven months after the consumers' group is formed. Though the group was formed to complete the project in time, it did not happen. District Development Committee (DDC), Solukhumbu and Imja River Suspension Bridge Users' Committee had signed a Memorandum of Understanding (MoU) on May 23, 2015 to build the bridge. According to the MoU, the bridge should have been ready by July 4, 2073. But nothing has been done to start construction work. The members of the users' committee have not visited the DDC office after receiving the first installment of the allocated budget for construction. DDC had earmarked funds for the suspension bridge after landslide swept away the suspension bridge over the river. Trekkers traveling to the Everest Base Camp are facing problem because of the lack of bridge over the fierce river. Karma Sherpa, a resident of Dingboche, said that locals and trekkers alike were facing lot of difficulties after the bridge over the Imja River was swept away by the landslide. “Construction of similar bridge in Chaurikharka has already completed,” he said, adding that the MoU to construction both bridges was signed at the same time. Tilak Basnet, a trekking guide, said that trekkers were facing lots of difficulties due to delay in the construction of bridge over the Imja River. Pushkar Prasad Pokhrel, a senior engineer with DDC Solukhumbu, said they are unable to go visit the project site due to difficult geography. “We will visit the project site in the spring season,” he added.